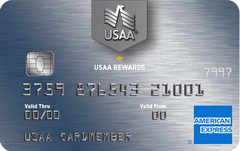 If you’re a member of the military who is looking for a reliable card to use for everyday purchases, the USAA Rewards American Express Card is an ideal choice – especially if you’re currently on active duty or plan to go overseas. It offers some of the best military benefits and protections you can get, making it a smart card to have on hand if you serve overseas. It also offers twice the points on gas and grocery store purchases, making it easy to rack up points on everyday purchases. Cardholders who aren’t military service members, though, won’t get nearly as much out of it. The card’s so-so rewards program isn’t as impressive as many of its competitors, and its maximum APR for cardholders with lower scores is way above average for a travel card. For cardholders who spend a lot on dining out, gas and groceries, the USAA Rewards American Express Card is appealing. It offers three points for every dollar spent on dining, two points per dollar on gas and groceries, and one point per dollar on everything else. Depending on how you redeem them, USAA’s rewards points are only worth a maximum of a penny each, though, which is typical for a run-of-the-mill rewards card, but significantly less valuable than many competitors. On some travel purchases, USAA’s points are worth even less. By contrast, many travel rewards cards offer at least three points or more on certain purchases, and some even offer points valued at a minimum of 2 cents or more. The USAA Rewards card does offer 2,500 bonus points after your first purchases, but the bonus is only worth about $25. On the plus side, USAA does have one of the more flexible rewards programs on the market – you won’t have to go too far out of your way to redeem earnings. There’s no limit on the number of points you can earn, so if you have a big family to feed and spend a lot on groceries and cash, you can take home a significant amount. Points don’t expire, so you also don’t have to rush to redeem them. There are no travel blackout dates, so you can travel whenever you want. Like most card issuers, USAA does make you go through the bank to redeem your points for travel, so you may not get as much value out of your tickets. It also doesn’t let you transfer points to other travel rewards programs. The biggest drawback to the USAA Rewards American Express Card, though, is its high APR for cardholders with less-than-perfect credit. The card’s minimum APR of 12.15 percent (variable) is one of the lowest rates available for a rewards credit card, making it an attractive choice for cardholders with excellent credit. However, the card’s range of potential APRs is so wide, it’s hard to tell how low a rate you’ll actually get. Cardholders whose credit scores are just high enough to qualify for the card may be offered an APR as high as 28.15 (variable) percent, which is dangerously high for a credit card and way above average for a travel card. The average rewards card, for example, charges an average interest rate of just 16.9 percent. Even the average subprime card charges a lower maximum rate. Despite its troublingly high interest rate for certain cardholders, the USAA Rewards American Express Card may still be a good choice if you’re an active-duty service member – even if you have less-than-perfect credit. For active-duty service members, this pro-military card offers some of the best protections you can get on a credit card. Such protections include a rebate on interest when you’re awarded a qualifying medal. In addition, USAA offers a number of premium travel benefits, such as car rental and travel accident insurance. It also doesn’t charge a foreign-transaction fee, which is a big draw for families spending extended time overseas. Why get the USAA Rewards American Express Card? You’re a member of the military and will benefit from the card’s protections and benefits. You spend a lot on eating out, gas and groceries and will get a lot of value out of the card’s bonuses. You have excellent and are confident you will qualify for the card’s lowest interest rate. To get the most benefit from this card, use it for all dining, gas and grocery store purchases. Consider adding your spouse or another family member as an authorized user in order to earn additional rewards from their everyday purchases. Contact USAA within six months of when you return from deployment or when you return from a campaign for which you received a medal in order to take advantage of benefits. To be eligible for travel insurance, use your card for all travel purchases.